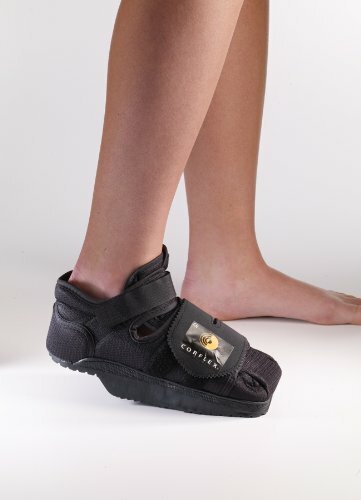 The HeelWedge off-loads the heel by shifting weight to the midfoot to promote faster healing after surgery, trauma, or when wounds are present on the heel. The modified rocker bottom encourages a smooth toe-off while maintaining a stable mid-foot base. Unique forefoot closure provides uniform security without the pressure points of buckles and straps and the cloth toe protector keeps toes warm and dressings clean and dry. The ankle strap seats the foot firmly in the sole and eliminates heel friction. The square toe design provides additional protection and better left/right fit.